Everyone used to think that a new amputee dog or cat could carry on with their old activities once the incision healed. But that thinking has changed. Today’s experts know that a Tripawd’s activities must be modified in order to avoid injury, and a veterinary rehabilitation therapist like Dr. Amy Kramer is the best person to show you how to do it. Today on Tripawd Talk Radio she explains all about the benefits of rehab therapy for Tripawds. 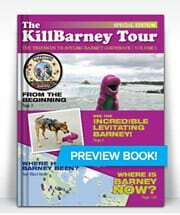 Tune in to Tripawd Talk Radio! Rehab therapy (also known as “physio” in many countries) is an important part of the Tripawd journey. 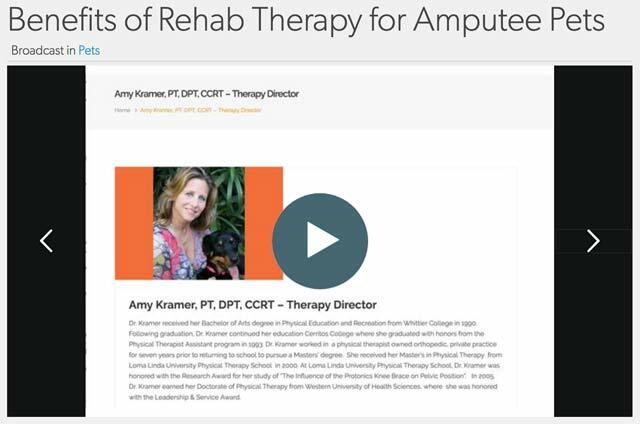 A rehab / physio expert can show you the best activities to keep your amputee pet fit and injury-free. 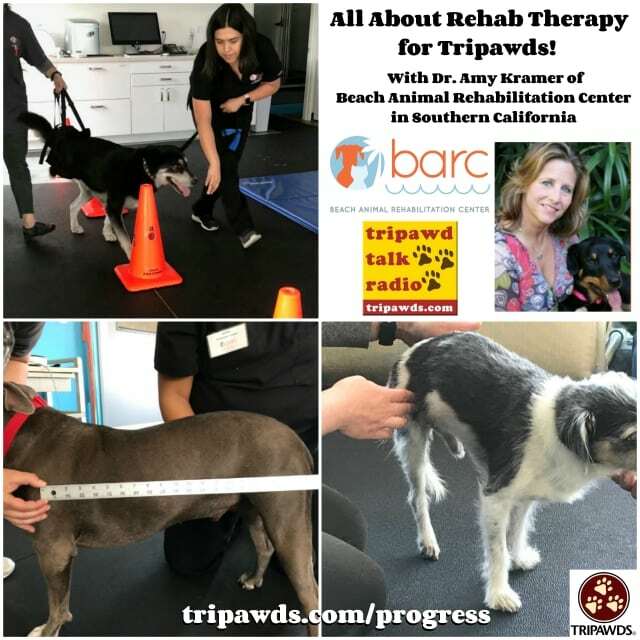 In this episode of Tripawd Talk Radio, we chat with Dr. Amy Kramer, PT, DPT, CCRT, from her practice, Beach Animal Rehabilitation Center in Southern California. We first interviewed her back in 2010 shortly after she helped establish the first veterinarian and physical therapist owned rehabilitation clinic in the country (if not the world). No time to listen? Check out these highlights of our conversation with Dr. Kramer. How Does Life Change for a Tripawd? The number one aspect of how life changes for a three-legged animal is they lose the ability to tolerate their same level of activity. “Things like their walk tolerance is going to be decreased, their ability to get on and off the bed or the sofa,” says Dr. Kramer. “They may still try because their brain doesn’t tell them any differently . . . and that puts them at risk for injury,” she explains. Each animal’s needs are unique. An expert can help manage what a “normal” activity looks like for every Tripawd. What are the differences between Tripawds who go to rehab right after amputation, and those who don’t go at all? Getting evaluated is an important first step. Image courtesy of BARC. When injury happens to a Tripawd, rehab therapy doesn’t just help heal the injury, it also helps in other critical areas such as building stronger core muscles. How do cats benefit from rehabilitation therapy? What kinds of rehab therapy exercises are helpful? Learn exercises you can do at home. Image courtesy of BARC. Laser Therapy to help with incision healing. “If the diagnosis was some form of cancer, we don’t always use laser, just for the fear of that maybe causing increased blood flow to the area and if there is still some cancer, we don’t want to help that spread,” explains Dr. Kramer. Acupuncture to help with nervous system healing. Ultrasound to decrease swelling and loosen tight muscles. Manual therapies such as passive range of motion, balance games and other things that parents can learn to do at home. This kind of owner education is the most important benefit of taking a Tripawd to rehab therapy. Underwater treadmill workouts. Why a treadmill instead of open-water swimming? Dr. Kramer says that swimming in a pool or pond is great for healthy animals who just need conditioning, but the underwater treadmill is better for dogs and cats with injuries that need treatment. Once the pain of an existing injury is brought under control, and once the amputation incision is healed, an underwater treadmill can help a new Tripawd learn to walk with less hopping, which decreases their risk of muscle strains. In addition, an underwater treadmill can help build up some strength, tolerance and endurance to allow them to go on longer walks. When is a wheelchair helpful for a Tripawd, and when is it not? Dogs who are ready for a wheelchair are those who are getting older and having maybe some other medical issues like arthritis in their remaining limbs. Meg is one such dog, and as her Tripawd wheelchair journey shows, work and patience is required from both the pet parent and the animal in order to use a wheelchair correctly. When the dog finally learns how to step instead of hop while in the chair, the device can be liberating. “You put those dogs in a wheelchair and their whole demeanor changes and they are happy again because they can go out for not just a walk but a long walk,” says Dr. Kramer. When money is tight, new Tripawd parents wonder if one rehab visit can really help. Absolutely! Dr. Kramer says “during that first visit, they learn so much about their pet and things they can do.” A good therapist will work with every Tripawd’s budget and situation, and design a home exercise program that makes a big difference in how the animal recovers and functions. We encourage you to visit your nearest practitioner today and get your Tripawd fit through the Tripawds Foundation’s Maggie Moo Fund for Tripawd Rehab! Tripawd Tuesday: Meet Osteosarcoma Survivor, Tripawd Nikki!